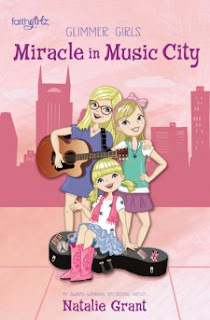 "Miracle in Music City" by Natalie Grant is book 3 of the Glimmer Girls series. The series is about twins: Mia and Maddie, along with their younger sister Lulu. Together the sisters solve mysteries as they travel with their famous mother, singer Gloria Glimmer. In book 3: "Miracle in Music City", Mia, Maddie and Lulu are invited to sing at the Grand Ole Opry for a fundraiser for the homeless. Unfortunately, their friends are jealous of the sisters' singing opportunity. One of the things I disliked about the story is that, in the beginning of the book, Mia and Maddie get back from a summer concert tour to find out that their best friends, Annabeth and Emily, made up a dance while they were gone. Mia and Maddie are really offended and a fight starts between the four friends that lasts throughout the whole book. I just think that the dance fight was made into too big of a problem in the book. One of the best parts in this book is the great moral about helping others. In the story the twins serve soup to the homeless and end up meeting a young homeless girl around their age named Ruby. Mia and Maddie try to come up with ways to help Ruby and her family when an expensive guitar goes missing and Ruby's family is the prime suspects. Can Mia and Maddie solve the mystery and help their new friend at the same time? I think that this book is good for 7 to 11 year old girls - especially those who like singing and dancing. The themes of helping others and of forgiveness are important morals.